Long before it was a hit Broadway musical, Les Miserables was a novel by French author Victor Hugo, a work which I believe was divinely inspired, as rich in eternal truths as it is. This tale of reformed confict Jean Valjean, the prostitute he befriends, the child he adopts, and the police inspector obsessed with bringing him down has been adapted for the screen numerous times. The upcoming version starring Hugh Jackman, Russel Crowe, Anne Hathaway, and Amanda Seyfriend is not the only star-studded modern take; this 1998 non-musical version starring Liam Neeson (Taken, Batman Begins), Geoffrey Rush (Pirates of the Carribbean, The King's Speech), Uma Thurman (Gattaca, Kill Bill), and Claire Danes (Romeo and Juliet, Little Women) is more than worth a watch. Clocking in at just over two hours, Hugo's immense novel is streamlined here, and die-hard fans will no doubt miss some of the omitted peripheral characters (sorry, Eponine). Still, the core of the story remains intact, and the film earns high marks all across the board: the music, cinematography, wardrobes, and production design are superb. 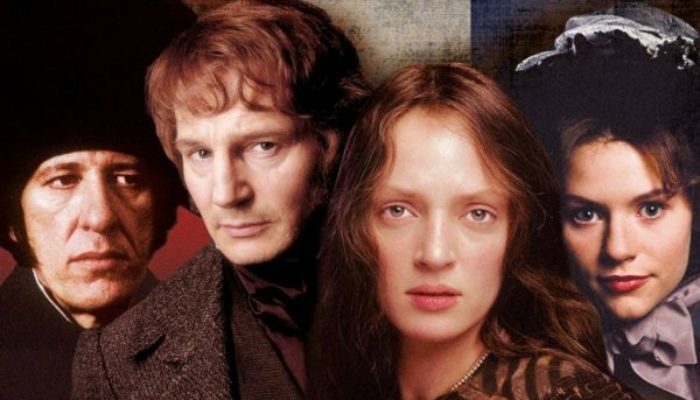 Rush excells as Inspector Javert, Danes impresses as Cosette, and Uma Thurman loses herself in the heartbreaking role of Fantine. Liam Neeson is masterful as Jean Valjean. A tender sequence with Valjean nursing the ailing Fantine back to health has to be the most beautifully realized demonstration of Christian charity that I can remember seeing on film. The movie stumbles slightly in the closing minutes: it ends abruptly, rather than with the stirring finale of the book and play, and a character walks away from situation that that he'd never walk away from. Overall, however, this is a moving and well-told story of redemption, revolution, dignity, and compassion amidst incredible hardship. Les Miserables is rated PG-13. It contains a few mild profanities, battle violence, a beating, and themes of prostitution that are pertinent to the story and handled tactfully. A sickly woman is seen briefly in her underwear, but the effect is heart-breaking, not arousing.